I told Caleb a couple of weeks ago that I wanted to find a book that I was really absorbed in and couldn't put down. I read a lot of books, I even read a lot of good books, but few are great. And I have this thing for great books. Well let me tell you - I picked this book up from the library on Sunday. I read half of it before the Superbowl, and then I finished the second half last night. It was so good! I really didn't want to put it down, which was exactly what I had been looking for. 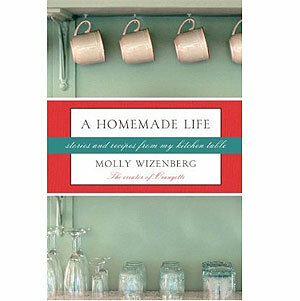 If you like to cook, or even if you just really enjoy food and consider eating an experience, please read this book! Molly Wizenberg is an incredible writer. She's funny, she makes you feel like you're tasting the food she's describing, she describes each memory behind her favorite recipes in a way that just makes you feel good. Personally, I thought Julia Child's My Life In France was boring. (Sorry Julia). I realize that may discredit me as a cook for all time, but I'm just being honest. She droned on about things that I thought were boring and wrote about too many recipes I know I would never even want to try, let alone make. But the recipes in A Homemade Life I actually want to try! I would definitely tweak some of them, but that's what I do with most recipes anyway. So if you're looking for a good read and/or some new cooking inspiration, read this!